Astronauts Reid Wiseman of NASA and Alexander Gerst of ESA have successfully completed what was the first US EVA of the year on Tuesday. The pair outside performed clean-up, replacement, and installation tasks on the exterior of the station. EVA-27 began at 12:30 PM GMT when the duo egress the Quest airlock, ending six hours and 13 minutes later. For the EVA, which began at 12:30 PM GMT, US astronaut Reid Wiseman was designated EV-1 and wore a suit with red stripes, while European astronaut Alexander Gerst was designated EV-2 and wore a plain white suit. Together, EMUs 3003 and 3010 were utilised for the EVA. Both Wiseman and Gerst conducted their first ever EVAs, with the pair both having been selected as astronauts in 2009. They have been aboard the station since May, having launched together on Soyuz TMA-13M/39S. Their crewmate, US astronaut Barry “Butch” Wilmore, who has been aboard the station since late September, operated the robotic aim and guided the duo through their tasks during the EVA. EV-1 Reid Wiseman was the first to egress from the Quest Airlock (A/L), followed by EV-2 Alexander Gerst. After the usual period of initial acclimatisation and safety tether setup, the pair went their separate ways to begin to prepare for the first and largest task of the EVA. That involved the relocation of a failed Pump Module (PM) that was in a temporary stowage location following its removal from the ISS last December. During the now infamous Christmas EVAs, the PM – which is responsible for pumping ammonia coolant through the station’s cooling loops – was removed from the ISS and replaced with a new unit after a Flow Control Valve (FCV) within the Pump & Control Valve Package (PCVP) within the PM failed, which meant that the station’s cooling loop A could no longer maintain a stable temperature. Three EVAs were planned to remove the old unit and temporarily stow it, install and connect the new unit, and then permanently stow the old unit. However, the removal and replacement was unexpectedly completed in just two EVAs, and given the close proximity to the Christmas period, there was little desire to perform a third EVA just to stow the failed PM. Thus, the failed PM had been stuck on the Payload ORU Accommodation (POA) – essentially a grappling unit attached to the Mobile Base System (MBS) that is used to “hold” items while keeping the main arm free – for over nine months, waiting for a chance to be stowed. 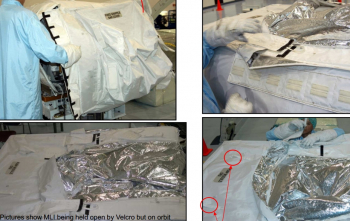 The stowage location for the failed PM is known as the PM Flight Support Equipment (FSE), which is essentially a Flight Releasable Attachment Mechanism (FRAM) compatible plate to which the PM bolts to, surrounded by a Multi Layer Insulation (MLI) “tent” to protect the PM from debris. The FSE was vacated by the PM that was used to replace the failed unit back in December; however at that time the FSE was located on External Stowage Platform-3 (ESP-3) on the Starboard side of the station. Since then, the FSE has been robotically relocated to ESP-2 right next to the Quest Airlock, in order to make the stowage task easier. ESP-2 has hosted a PM before, but that unit was returned to Earth aboard the final Space Shuttle flight in 2011, to enable it to be studied following its failure. In order to perform the PM stowage task, EV-1 Wiseman first opened the MLI “tent” on the PM FSE, while EV-2 Gerst installed an Articulating Portable Foot Restraint (APFR) onto the end of the Space Station Remote Manipulator System (SSRMS) arm. Gerst then ingressed the APFR and be “flown” on the end of the arm up to the MBS POA, where the failed PM is located. “OK Butch, I’m ready to fly,” said Gerst as the arm was giving a go for first motion. 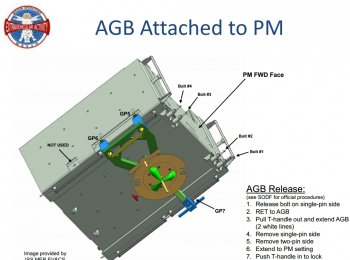 Once Gerst had a firm grip on the PM, it was robotically released from the POA, whereupon Gerst will be flown back down to ESP-2 where the PM FSE is located. At this point, the Adjustable Grapple Bar (AGB) – which is a grapple fixture that can attach to multiple Orbital Replacement Units (ORUs) in order to allow them to be grappled by either the SSRMS or the POA – was removed and installed onto its regular stowage location on a Flex Hose Rotary Coupler (FHRC) ORU on the underside of ESP-2. The failed PM was then slid along rails into place on the base plate of the FSE, whereupon it was bolted into place with four bolts, with three electrical connectors also mated to provide power and data to the failed PM. Although technically the PM has failed, the unit is far from useless, as it is only one single valve inside the otherwise serviceable unit which has failed. Thus, were an external valve to be connected, the unit could still be used as a viable spare, and thus the unit will be retained for potential future use. With the PM safely installed onto its FSE and its MLI “tent” closed around it, the two spacewalkers moved on to their next task – the replacement of a failed light on a camera unit attached to the US Destiny Lab. In a mouthful of acronyms, the External Television Camera Group (ETVCG) at Camera Point 13 (CP-13), which consists of a piece of hardware called a Camera/Light PTU [Pan/Tilt Unit] Assembly (CLPA), needed to have its failed light removed and replaced with a new unit. The light is used during orbital night in order to illuminate the exterior of the station for the remote controlled camera. This was a fairly simple procedure, involving the disconnection of a single electrical connector and the driving of a single bolt to remove the failed light, then doing the reverse to install the new light. Thus, EV-2 Gerst performed this task alone. Meanwhile, EV-1 Wiseman completed the task of installing the Mobile Transporter Relay Assembly (MTRA) onto the Mobile Base System (MBS). 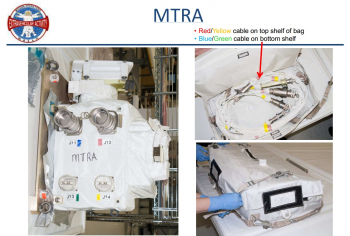 The MTRA is essentially a power box that will provide the MT with a redundant source of power in the event that the primary source in unavailable. The MT is a remotely operated “rail car” than can travel down rails on the station’s external Truss. Attached to the MT is the MBS, which features attachment points for the robotic arm, meaning that the arm can hitch a ride from one end of the station’s Truss to the other in order to facilitate access to either end in order to, for instance, support EVAs to replace failed components on the solar arrays. However, in certain scenarios where electrical power is lost – for instance, the loss of two of the station’s eight power channels – then this could lead to a loss of power to the MT, making the arm unable to reach to the areas of the Truss it would be needed in order to support EVAs to replace failed components to restore power. The MTRA will thus provide a secondary source of power in order to add some redundancy in the event of this scenario occurring in future. 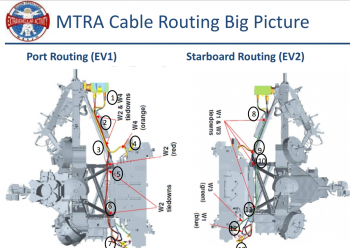 The MTRA box was slid into a previously unused Camera Port (CP) connector atop the MBS, with a single bolt driven to secure the MTRA in place. A number of electrical jumpers were then connected to provide the power connections between the MTRA and MT. Once Gerst had finished up with the CP-13 ETVCG light R&R, he assisted Wiseman with the task of manually mating the cables. Once this was complete, the spacewalkers cleaned-up their tools and were scheduled to head back inside the Airlock to conclude the planned 6.5 hour EVA. However, get-ahead tasks were then considered. With the primary tasks be completed ahead of time, a number of get-ahead tasks were available for the spacewalkers to complete. These include the retrieval of the ETVCG at CP-7 – essentially, bringing a camera inside – since the camera at this location, which is on the nadir side of the P1 Truss, right in front of the Node 3 Forward berthing port – will preclude the Permanent Multipurpose Module (PMM) from being relocated to this port next year as part of the ISS reconfiguration in prep for the commercial crew vehicles. 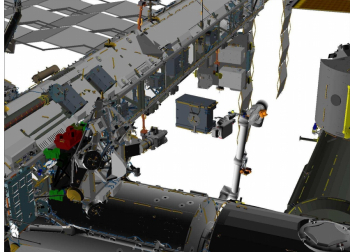 An APFR and attached Tool Stanchion (TS) could also be moved to another position on the aft side of the S0 Truss, since in its current location it will cause interference with the robotics activities associated with the PMM relocation. 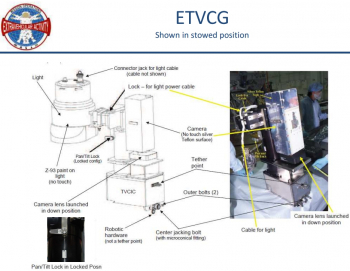 Other get-ahead tasks include routing Ethernet cables for the arrival of the much-delayed Russian Multipurpose Laboratory Module (MLM), retrieving an avionics bag from outside Node 3, reconfiguring the Port and Starboard Crew & Equipment Translation Aid (CETA) carts, installing a clamp on an airlock handrail to cover up a debris strike, and retrieving a bag left outside the airlock since last December’s EVAs. In the end, the option to conduct a get ahead involving the retrieval of two bags was removed, allowing the duo to ingress Quest and end the EVA after six hours and 13 minutes.